The Dunhuang Foundation is committed to preserving Dunhuang's past and providing for its future. Our programs encourage participants to explore and expand upon the site's rich histories. We work closely with institutions across the United States, Europe, and Asia to promote Dunhuang. The Dunhuang Foundation has a long-standing relationship with the International Dunhuang Project at the British Library and the Dunhuang Academy in China. In October 2015, the Foundation co-sponsored an exhibition, Visualizing Dunhuang, with the Princeton University Art Museum and a related symposium with the P.Y. and Kinmay W. Tang Center for East Asian Art. The Foundation worked with the Getty Center to create an immersive technology experience for the landmark exhibition, Cave Temples of Dunhuang: Buddhist Art on China's Silk Road, which opened in May 2016. 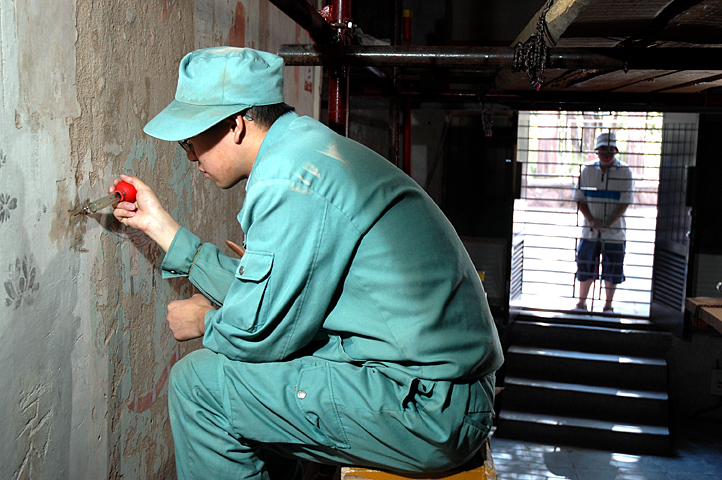 A conservator works on a mural as a tourist looks on. We support the physical conservation of Dunhuang caves through project-specific grants. The Dunhuang Foundation contributed over 3 million USD towards the Dunhuang Academy's Visitor Center, the centerpiece of the Academy's new visitor management system. We are working with the Dunhuang Academy to realize a multi-year preservation strategy that will digitally archive the contents of each cave using state-of-the-art imaging techniques. The Dunhuang Foundation helps allocate funds for the complete digital preservation of specific caves, such as Cave No. 360, sponsored by Dennis Fong and Polly Kam. With generous funding from the Andrew W. Mellon Foundation, the Dunhuang Foundation has helped advance the Academy's digital strategy by providing consultants, funding for new positions, and sustained dialogue through the creation of the Digital Dunhuang Advisory Council. We provide educational opportunities for young scholars, Dunhuang Academy staff, and the general public. Public outreach is a top priority. The Dunhuang Foundation sponsors a graduate-level conservator training program at the Academy in conjunction with Lanzhou University, the Courtauld Institute of Art, and the Getty Conservation Institute. The Foundation recently launched an Artist in Residence program, which brings renowned artists to Dunhuang to engage the wealth of material at the site for inspiration. The Foundation provides travel funds for thematic conferences as well as long-term scholarly exchange. Graduate-level researchers and Ph.D. candidates are welcome to inquire about dissertation research grants or English language teaching fellowships.